Shonda Caines is a Wellness Catalyst, Vegan Fitness Chef, Speaker, and Best-Selling Author. After losing and keeping off 90 lbs, she strives to empower women to maximize their health and fitness. During her journey, Shonda quickly realized the power of nutrition. She says there’s a direct correlation between what we eat and our overall wellness. As a native of the Caribbean, she grew up eating home-cooked meals, infused with herbs and spices, thanks to both parents as Chefs. As a result, she began cooking at a very young age. 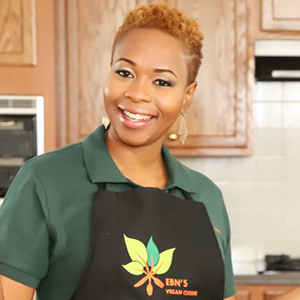 Soon after the birth of her wellness company, Awaken Your Wellness, LLC, she birthed EBN’S Vegan Cuisine, LLC to help her clients further and expose others to the power of plant-based foods. It is her philosophy; both are needed to thrive and live a healthy, wholesome and active lifestyle. EBN’S Vegan Cuisine offer various services that introduce, teach and help clients succeed on a nutritious, whole foods meal plan. We cater to those seeking to increase their overall food intake, reverse common health ailments, recreational athletes and beyond; both individual and family services are available.